Topics: Priority Groups, and Faqs. 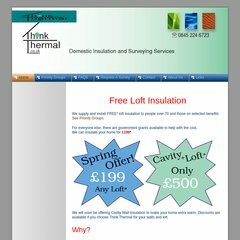 thinkthermal.co.uk Priority Groups - loft insulation, free loft insulation, cavity .. It is hosted by 1 1 Internet Ag Baden-wurttemberg, using Apache web server. Thinkthermal.co.uk's IP address is 82.165.120.178. It has 2 DNS records, ns59.1and1.co.uk, and ns60.1and1.co.uk. PING www. (82.165.120.178) 56(84) bytes of data.